Pruebe una alternativa única a una noche típica en el centro de Boston con una emocionante cena a lo largo de la costa de la ciudad. Esta expedición de 3 horas en el puerto de Boston ofrece una comida bufé libre con entretenimiento en vivo y baile. Mire la puesta de sol, luego dé un paseo bajo las estrellas y disfrute de la vista del horizonte iluminado de Boston por la noche o diríjase a la pista de baile para escuchar música y divertirse dentro de la discoteca del barco. Trae a esa persona especial o a un grupo completo de amigos para que recuerden una noche. Cena al atardecer, baile y crucero por el puerto de Boston. Lujoso bufé de todo lo que puedas comer, incluida la estación de tallado. Fiesta de baile con DJ en vivo. 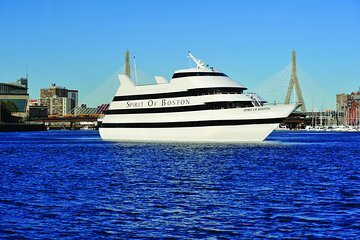 Este crucero con cena es uno de los mejores lugares de Boston para combinar cenar, bailar y hacer turismo en una noche. Disfruta de una vista de la ciudad desde el histórico paseo marítimo. Tres cubiertas interiores climatizadas con ventanas panorámicas permiten una vista perfecta del horizonte de Boston. Cuando el barco salga del Seaport World Trade Center en Commonwealth Pier, diríjase al elegante buffet de la cena, que incluye ensaladas, platos principales y postres, preparados en el barco. La excelente comida y el entretenimiento van de la mano en este crucero, así que disfrute de las presentaciones en vivo y el ambiente festivo durante la cena. Luego, tome un refrescante cóctel en el salón flotante de la azotea, diríjase a la espaciosa plataforma de observación para dar un paseo bajo las estrellas bajo la luz de las estrellas o vaya a la pista de baile con uno de los mejores DJ de la ciudad, con los mejores éxitos de una variedad de géneros. Las atracciones notables a lo largo de la ruta incluyen Zakim Bunker Hill Memorial Bridge, el histórico USS Constitution y el próspero distrito de Seaport en Boston. PESIMA EXPERIENCIA EL CRUCERO ESTAB VENDIDO PARA UNA EXCURSION DE HIGH SCHOOL PERDIMOS EL TIEMPO, MAL SERVICIO NUNCA MAS USARE VIATOR !!!!! Amazing! I highly recommend this dinner cruise perfect for any occasion! Phenomenal buffet and the harbor cruise sights are stunning! This was a birthday celebration idea and what a great and unique way to spend the evening with friends for a special occasion. We did the dinner cruise hoping to see some of Boston Harbor. We did not take into account the fact that it essentially gets dark 2 hours sooner on the East Coast as opposed to where we live on the Gulf Coast. So, it was pitch black when we boarded the ship. The food was good and the employees friendly and professional. Things ran quite well and everyone knew their rolls and timing. Departure and docking was smooth. One of the things that we learned was that they had different seating assignments based on your willingness to pay upgrades. We asked for a window seat and were told that our ticket was not for window seating. It was not apparent to me when I made the reservation on Viator that this would be the case. I had assumed it was general admission because I only saw 1 reservation admission price for this cruise. After returning home, I went directly to the Spirit of Boston web site and saw that there were obviously different tiers of pricing on their site. The cruise ship was nice, as it has been recently renovated. It had 3 decks of seating and an upper, observation deck. We boarded and asked if we could go up to the 3rd deck. Again, for a better harbor view. We were told we could and did so. We got a drink and got seated. After a few minutes a supervisor came and told us that the deck we were on was reserved for a group. There had been several busses disinterring guest when we arrived and some of them were apparently prepaid charters for the cruise. We were escorted to the lower, 1st deck. I explained that we had asked if we could go up and were told we could. The supervisor replied that the crew member should have distinguished whether we were in the private party group before doing so. Politely handled, but could have been avoided. Viator apparently forgot to book the dinner with the Spirit of Boston. Thank goodness I had made a copy of the booking with date and all the information sent to me via Viator. It did NOT have a confirmation number, but showed I did pay. The Spirit of Boston said it was not their vault as Viator did not book it. And the shipped was completely booked and had no extra seats! But thank goodness they were kind enough to place us on another of their dinner cruises that evening. It was not what I had wanted or booked but as we just had flown in that afternoon and planned dinner on the Spirit of Boston we were tired and hungry. And we could not rebook for another date as we were there for only that weekend. Viator goofed big time!! But the owners of Spirit of Boston did work and get us on another dinner cruise that evening within the hour. Not the food we had planned on but at least they work to fix the royal goof by Viator. We did not have the sunset dinner cruise with a buffet but a plate dinner after sunset. This was a brilliant night out. Delicious choice of meal for our dinner followed by a great disco where we were never off the dance floor. They served our drinks in special souvenir glasses and there was a promise of one to take home at the end of the evening but it didn't materialise. Would've been a nice touch had they kept that promise. Great views of the Boston skyline from the water. Not a lot of cruising as the boat appeared to be stationary once we had left the dock. But a great evening was had by us all. This is a must if you are visiting Boston. Food was great and the scenery was amazing. It's highly recommended from our family. Even though it was raining it didn't stop the wonderful time we had. The cruise director and the staff were wonderful and very helpful. The food was really good. We will take this cruise again next time we are in Boston. Were a party of 4. Cruising on the Spirit of Boston is always enjoyable, and we are looking forward to our next trip.